What The World Needs To Do After Venezuela's Vote : Parallels Venezuela's latest vote will worsen its crisis as it consolidates its socialist authoritarian system. But Washington is not well-positioned to lead the charge to stop it, writes Ted Piccone. Marcos Carbono (center) joins a protest against the weekend's election in Venezuela in front of that country's consulate in Miami. President Nicolás Maduro may have won the vote count but in the process lost the legitimacy to govern, one expert writes. Ted Piccone (@piccone_ted) is a senior fellow in foreign policy at the Brookings Institution. Venezuela's latest electoral affair only worsened the country's continued slide from a relatively stable middle-income democracy to a socialist authoritarian system stricken with hyperinflation, rising poverty, declining oil production and record levels of violent crime. Rather than boost President Nicolás Maduro's standing after five years in power, the low voter turnout — down from 80 percent in 2013 to 46 percent on Sunday — coupled with a clear rejection of the results by the United States, Canada and a group of 13 Latin American nations, leaves the protégé of former President Hugo Chávez with a crisis of governability. Maduro may have won the vote count but in the process lost the legitimacy to govern. Venezuela's deterioration toward despotism and despair comes as little surprise. For years, experts have warned that increasing executive control of the country's democratic institutions alongside gross mismanagement of its oil-dominated economy would lead to worsening conditions for its 30 million citizens. Hundreds of thousands of Venezuelans have left the country in the past two years, many of them desperate to escape the confluence of food and medicine shortages, lack of decent jobs, terrible crime and political repression. The situation today is a tragic reversal of the heady days when Chávez first launched his Bolivarian revolution in 1998, promising to spread Venezuela's vast petroleum wealth more fairly among the majority poor. For years, the charismatic revolutionary rode the wave of high oil prices to deliver social benefits to his constituents, helping him not only to overcome general strikes, mass protests and a coup attempt, but also to win relatively free and fair elections multiple times. He abused that electoral popularity and government largesse to rewrite the constitution in his favor, create paramilitary "Bolivarian circles," stack the courts and electoral council with his loyalists, control the state-owned oil firm, and stifle free media. Chávez also effectively used the country's oil reserves, the world's largest, to insulate his regime from U.S. pressure, securing favorable loans from China and new military equipment and energy deals from Russia. By the time Chávez died in March 2013, the winning formula for an elected authoritarian was well-entrenched. His hand-picked successor, Maduro, narrowly won elections a month later and quickly consolidated control by digging even deeper into the trough of state resources to buy off the military, nationalize industries and woo enough voters to stave off electoral defeat. This strategy, however, has probably run its course. With mounting foreign debt, falling oil production, increased sanctions, diplomatic isolation and a spreading humanitarian crisis on his hands, Maduro can survive only by taking painful steps to reform a system that fuels his regime's authority. Since this is unlikely, we should expect to see an increasingly desperate hardening of his administration's tactics against his opponents, domestic and foreign, and an intensified reliance on China and Russia for support. The goals are relatively clear — weaken Maduro enough to force him to negotiate a peaceful exit while preventing a worsening humanitarian crisis. Washington, however, is not well-positioned politically to lead the charge. For the United States and the international community, Venezuela presents a particularly tricky case. The goals are relatively clear — weaken Maduro enough to force him to negotiate a peaceful exit while preventing a worsening humanitarian crisis that is already destabilizing neighboring Colombia and fragile Caribbean states and could bring thousands of desperate Venezuelans to U.S. borders. Washington, however, is not well-positioned politically to lead the charge. Threats of military intervention, already uttered by President Trump, are a non-starter. Support for a military coup likewise would seriously set back U.S. standing in the region. For the past three decades, the U.S. has mostly stood firm in support of democratic and negotiated solutions to the Latin America's internal political crises. 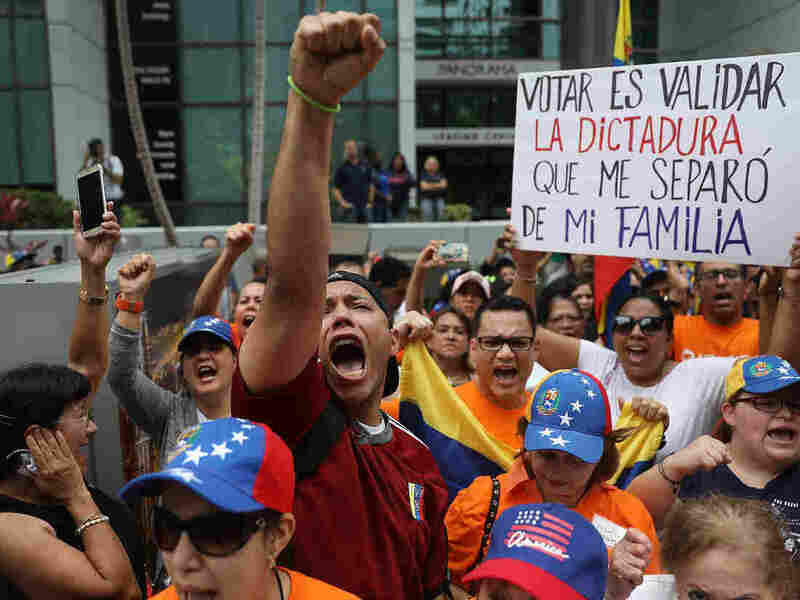 That leaves expanding the list of targeted economic sanctions, coordinated with partners in the region and Europe, to pressure Maduro and his allies to come to the negotiating table in a serious way. Up until now, Maduro has managed to avoid such a negotiated pact with the opposition, which remains divided and demoralized. They are not, however, defeated. They will likely return to the streets to protest the government's abuses and economic malfeasance. As the country becomes more ungovernable, moderates in the ruling socialist party may realize that the benefits of the current system can only be preserved through compromise. A new mediation process should be launched as soon as possible, facilitated by the United Nations under the secretary-general's banner of conflict prevention, and supported by a coalition of states that includes not only key South American countries like Peru, Chile and Argentina, but also the United States, France, Germany, China and the Vatican. An early agreement should be reached to allow international agencies to deliver humanitarian assistance to malnourished and sick Venezuelans before they attempt to leave the country. And a package of economic incentives should be assembled to prepare for a post-Maduro scenario. In sum, while Maduro may claim a historic victory that solidifies his hold on power, the reality is just the opposite. If the domestic opposition can rally, it will signal to the international community that a coordinated plan of increased sanctions and facilitated talks is feasible.